Is Abjol Miah ashamed of Respect? There’s something odd about this Thursday’s by-election in the Tower Hamlets ward of Weavers. According to the list of candidates on the council’s website here, Abjol Miah describes himself as the Respect candidate. This, of course, is unsurprising since Abjol is a leading figure in Respect and was that party’s group leader on the council until 2010. Lots of Labour red, lots of Lutfur Rahman…but not one mention of the word ‘Respect’. Is this a warning to the voters of Bradford West? The George Galloway and Respect brand may have been victorious there but in Tower Hamlets, which witnessed their ups and downs for five fascinating years, their names seem toxic. Very clever, he’s not said he’s anything else or that he’s an independent, so I think he’s within the law – but not entirely sure. Interesting that they see it as a toxic brand now. There’s another way of looking at it, though: that the Lutfur brand is so strong that it would be madness not to capitalise on it. That would be worrying for Labour. But it shows you just how close Lutfur and Respect are now. It is a letter from Our Dear Leader to the residents of Jesus Green in Weavers. Invoking the Cameronesque tone of “I share your concerns”, he tells them that he’s looking into supposed traffic problems in the area – and then thanks Abjol Miah for bringing it to his attention. If this letter is not an actual abuse of purdah and election rules, then it is very close to being one. 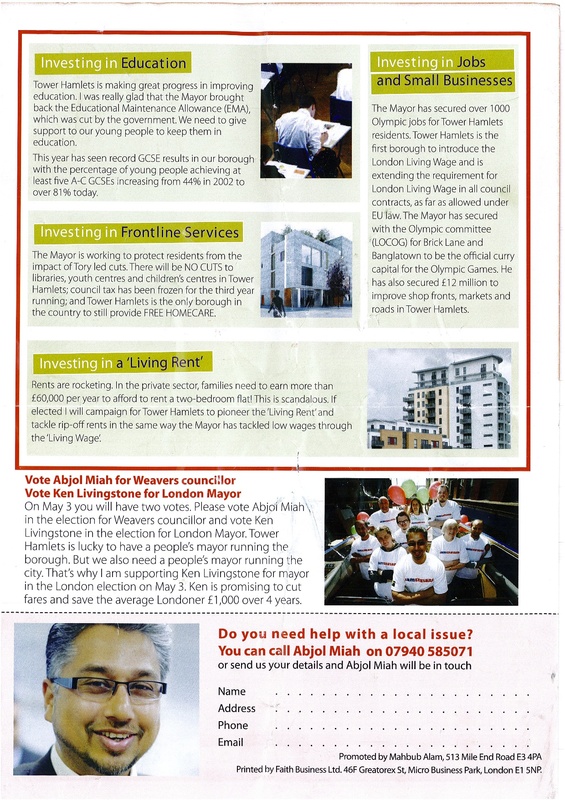 I attach a copy of a leaflet circulating in Jesus Green, Weavers ward, where there is a by election on Thursday. 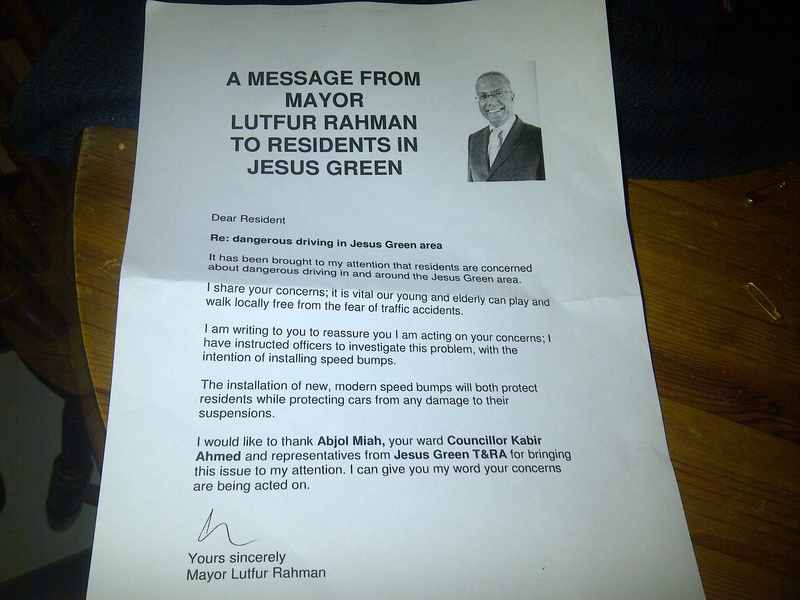 You will note that the leaflet is supposedly a message from the Executive Mayor. 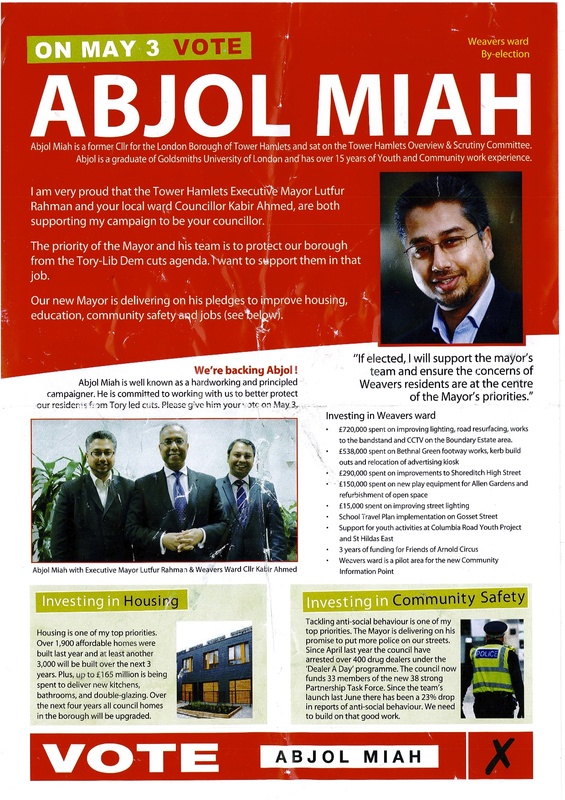 Furthermore the leaflet (which has no imprint) supports Abjol Miah, a candidate in the election on Thursday. This leaflet implies that council priorities have been adjusted to give support to a candidate in an election, less than a week before polling. As a matter of interest residents are bemused as there is no indication that there is a need for traffic calming on a road that is often difficult to drive through due to parked vehicles. Why have council priorities been adjusted for naked political and electoral purposes? Were elections always so tortuously controversial? The council holds budgets for prioritising highway safety. Views of local residents would quite properly be taken into account in deciding which measures to implement where safety issues are identified. The Mayor can direct how budgets should be used to address residents’ concerns, particularly where an intervention is required to promote safety. If speed bumps are required then the appropriate consultation processes would of course follow. Finally, as the letter was not published using council resources there has been no breach of pre-election rules. So what they’re saying is that Lutfur can take whatever executive powers he wants in a pre-election period as long as it’s not publicised with taxpayers’ money. Who did fund that letter (it has no imprint)?